Somalia native Bakar Ali, above, came to the U.S. in 2009. NTID English professor John Panara recalls Ali as one of his best students citing his leadership skills and commitment. 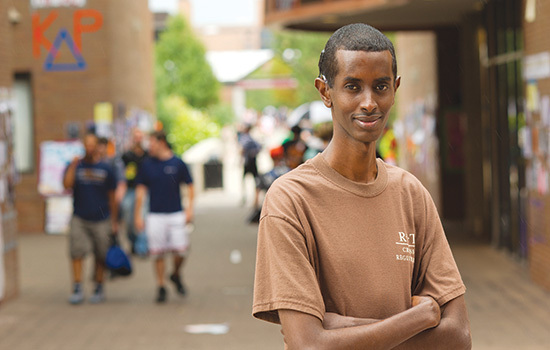 Bakar Ali, an RIT/NTID urban and community studies major in the College of Liberal Arts, is used to pressure. Born in war-torn Mogadishu, Somalia, his mother was killed in a mortar attack. He was homeless and lived on the street when he was 7. Ali recalls going three days without food after the death of his mother. He became deaf as a teenager after a bout with malaria and fought to attend school—no one wanted to accept a deaf student and no access services were provided. Ali attempted to start a national association to help deaf Somalians. In 2006, Ali helped establish the Somali Deaf Union, the first Somali organization for deaf individuals. That later developed into the Somali National Association of the Deaf, and he became president. But he became a target of terrorists when he met with government officials while starting his association. He moved to Kenya in 2007 and relocated to Lansing, Mich., two years later. “I did not come with any money or assets, but I came with a mind full of desires and a heart full of dreams,” he says. He worked hard in a factory job in Michigan and was soon made a team leader. He learned English and received scholarships, financial aid and loans that allowed him to attend RIT—a place that a friend years earlier told him he should think about attending. “He told me about RIT, and I wished I could come here, but I never dreamed that one day I would be here,” Ali says. He has made the dean’s list and attended classes in the summer while keeping busy working as a research assistant. Ali also worked in Wallace Library, completed an internship with the Center for Youth in Rochester, and prepared for his role as cross-registered senator in RIT Student Government, a new position that he hopes will empower students. It’s clear Ali doesn’t have time for hobbies—or much sleep.